Everyone loves a delicious brunch, and when you’re in Downtown Boulder the brunch options are endless. It’s hard to narrow down on just a couple of restaurants, but I’ve chosen my top 3 all time favorites that can’t be missed. I love River and Woods. I went there with my family and we all ordered a glass of rosé to start. After skimming the menu I decided on the Manny’s Breakfast Burrito (pictured above). 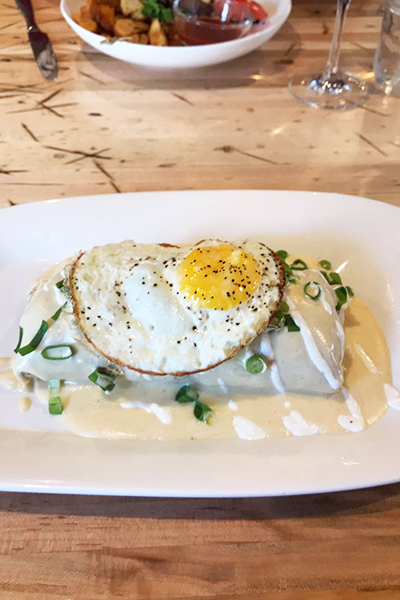 This burrito was stuffed with chorizo and topped with sour cream, green chili cheddar queso and a sunny side up egg. It was savory, rich, and unlike any breakfast burrito I have ever had. I still dream about it to this day! I managed to sneak a bite of my sister’s Croissant B.e.L.t. sandwich which included tender belly bacon, an over-easy egg, tomatoes, chive cream, greens, and pepper aioli all on a fluffy croissant. This twist on a classic BLT and breakfast sandwich was also extra tasty. Another classic spot for brunch is Snooze. I swear Snooze NEVER disappoints when it comes to their food. The menu is full of unique, mouthwatering options. I always seem to order the same thing when I’m there...the Bella Bella Benny. My mom can vouch for this Benedict, as it's one of her favorites also. I switch it up by getting my eggs scrambled on toasted ciabatta with prosciutto and taleggio cheese topped with cream cheese hollandaise, a balsamic glaze, and arugula. I highly recommend giving this Benedict a try! It’s hard not to order one of Snooze’s pancakes, so I always include a cinnamon roll pancake on the side to end with something sweet. One of my favorite spots that’s a real treat on the West End is SALT the Bistro. If you ever find yourself at SALT for their weekend brunch you HAVE to get their beignets. These beignets are literally to die for! My dad and I shared a plate and successfully finished them all, and could have probably eaten much more! We still had more food to come after chowing down on the beignets. I couldn’t resist giving their eggs Benedict a try, I ordered my eggs scrambled on top of an English muffin with prosciutto, hollandaise, and some greens with a side of brunch potatoes. This was the perfect amount of savory (with the eggs Benedict) and sweet (with the beignets). I also have to add that Marissa, Downtown Boulder’s Marketing Manager, is obsessed with the Bodego Sandwich at Emmerson. I have yet to give it a try, but have marked it as my next brunch excursion! The next time you’re searching for your a brunch spot let your taste buds take a journey at one of these tasty restaurants.